must-see tile designs that just might inspire a reno. A marble mosaic backsplash lends an elegantly modernized layer to a monochrome kitchen. A solitary moment of movement, above the stove, captures the eye in a contemporary space of a reserved palette. Now that’s what we’d call a focal point. 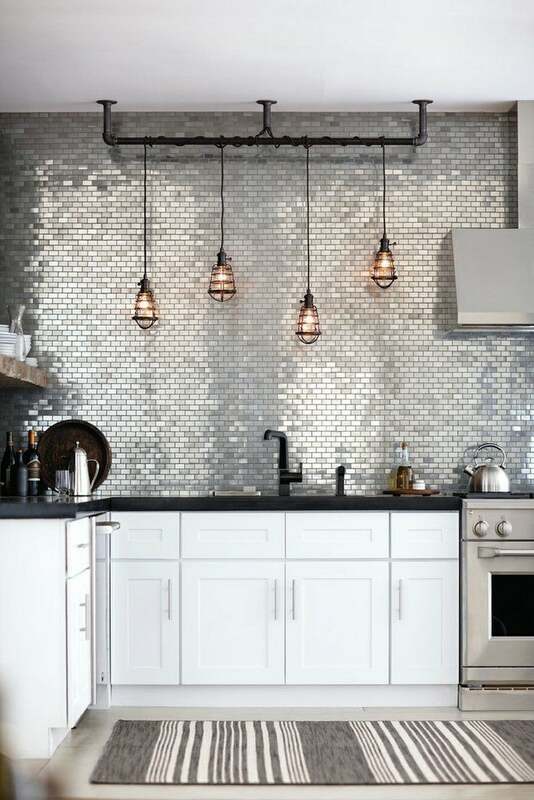 We can’t get enough of this exquisitely defined backsplash featuring a handmade mosaic crafted of Marcasite jewel glass. A captivating pattern of a classic color scheme provides a seamless transition within a contrasting mix of decorative styles. The hand-painted tiles of this stunning kitchen channel a slew of inspired details from Italian textiles to Moroccan mosaics. A playful pattern lends a charming touch to the clean-cut details of this contemporary kitchen, scattered with a handful of rustic elements. A black on black aesthetic accentuates the stunning finish of the stained wood cabinets of this fearlessly dynamic kitchen. For the kitchen in need of a little exotic flair, we’re all for this colorful Moroccan tile emulating the captivating shades of the Mediterranean. Blues rule in this inspired Australian kitchen of a whitewashed aesthetic, effortlessly elevated by a vibrant display of vintage tiles. See the rest of this home here! Matte black walls paired with glossy metro subway tiles are what dream kitchens are made of. Get the full tour here. In this Andalusian kitchen, an unusually pleasant shade of green steals the spotlight, complementing the intricate details of the stunning custom backsplash. A mirrored backsplash lends a lustrous touch to this modern kitchen, emulating the sense of a larger space. Elevate a basic subway tile with a dark grout for a truly statement-worthy finish in a vintage space. An intricately colorful backsplash steals the spotlight in this charming country kitchen filled with rustic touches of natural wood.